In my opinion, fall is one of the best times of the year, and it’s a time to enjoy all the coziness that your home can provide. My motto is, it doesn’t have to cost a lot to have the home you love! 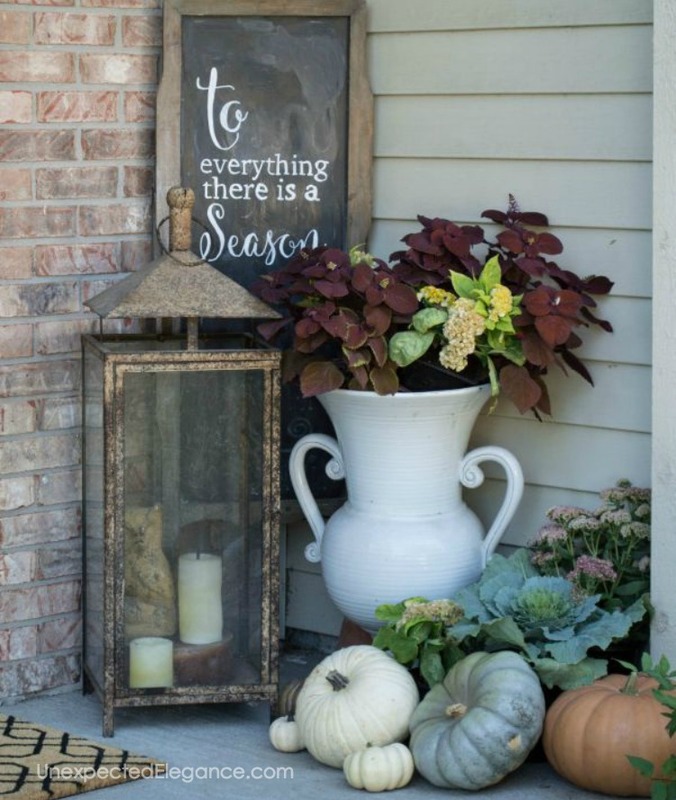 Whether you shop for items at the Target Dollar Spot or break out the spray paint, you’re going to love these inexpensive ways to decorate for fall. If you want to decorate the outside of your home, you can find so many natural items. Create a display using small hay bales, dried cornstalks, potted mums, pumpkins, and squash. If left un-carved, pumpkins will last for a long time. Don’t forget about FREE yard clippings, either! Chances are you have items in storage that you no longer use. Why not break out the spray paint and make it into a beautiful fall decoration? Metallic colors are great for fall. Aged bronze and gold are some of my favorite metallics this time of year. You can also spray paint items in traditional fall colors, like burnt orange, brown, or red. If you don’t have any unused items around the house, check your local thrift stores! Target’s Dollar Spot or even the Dollar Tree has so many fun items. Whether you want to decorate your dining table or entryway, you’ll find so many cute items. 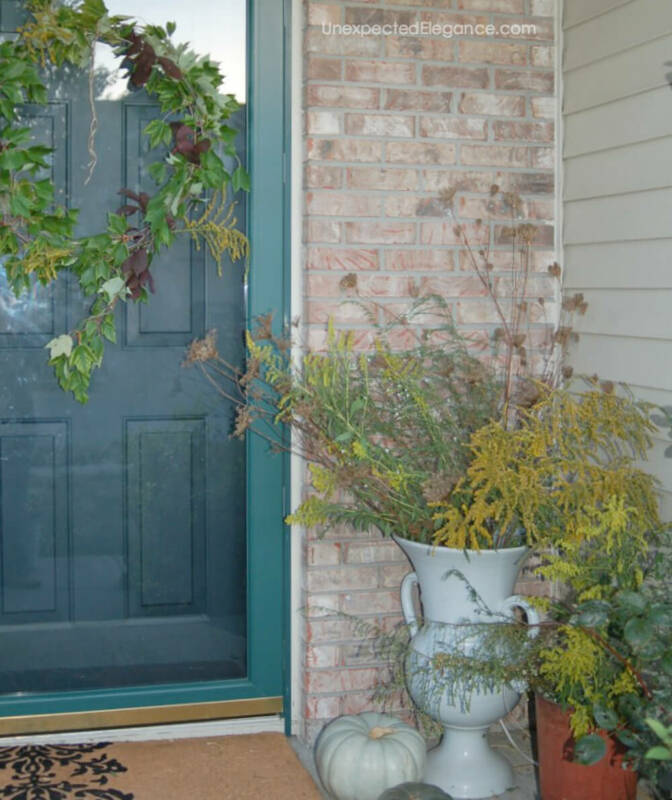 You can even find everything you need to make a wreath for your front door. Items go quickly though, so be sure to shop often and buy anything you think is cute because it might not be there next time. Whether it’s pieces of scrap from a home improvement project or pieces you’ve chosen to recycle, you can turn old wood into decorative signs. Use white paint as a base and then brush lightly with a brown gel wax stain to give it an aged look. You can then add a saying of your choice to the sign. 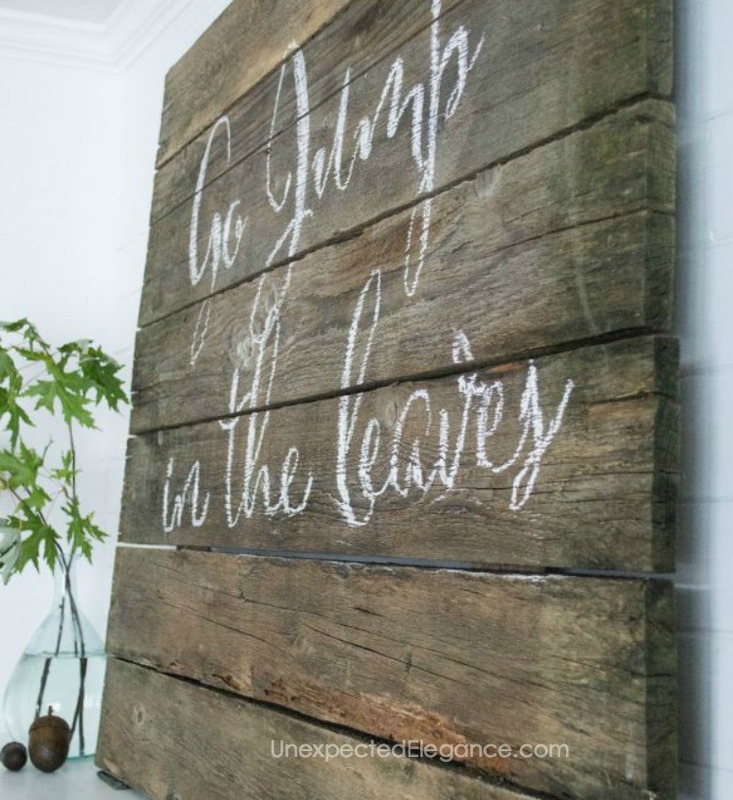 I made this sign a few years ago using just chalk for the lettering…it’s still one of my favorite mantels. Last, but not least, switch out the flower arrangements in your home with something fall inspired. Go outside and clip a few branches that have changing colored leaves. This is such a simple and FREE way to add drama to your fall decor. 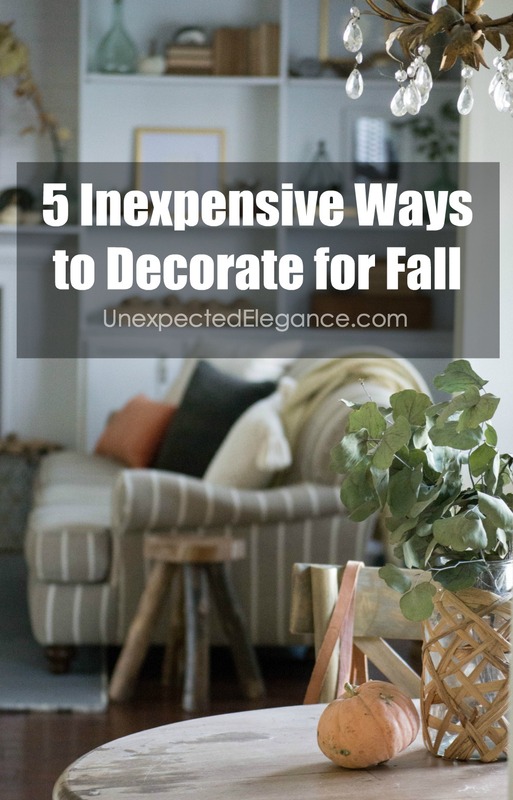 You don’t have to spend a fortune decorating your home this fall. 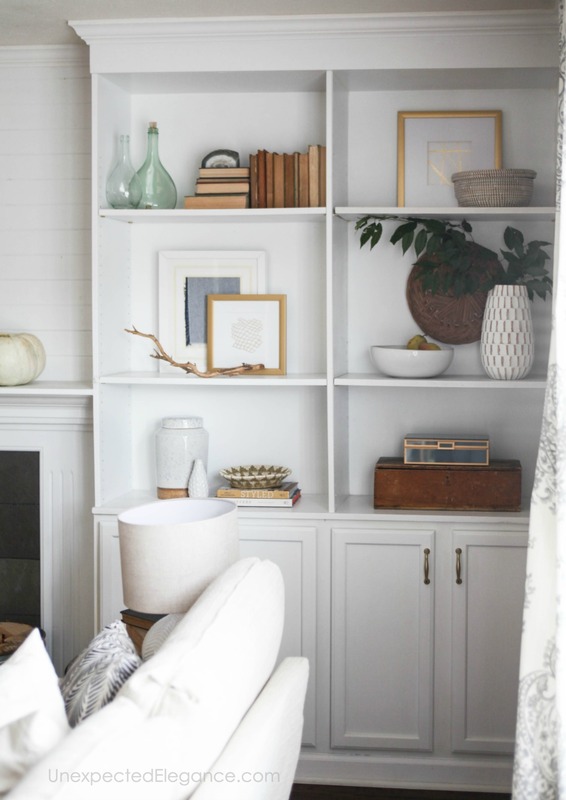 There are so many things you can do to make your home cozy and beautiful while on a budget!! 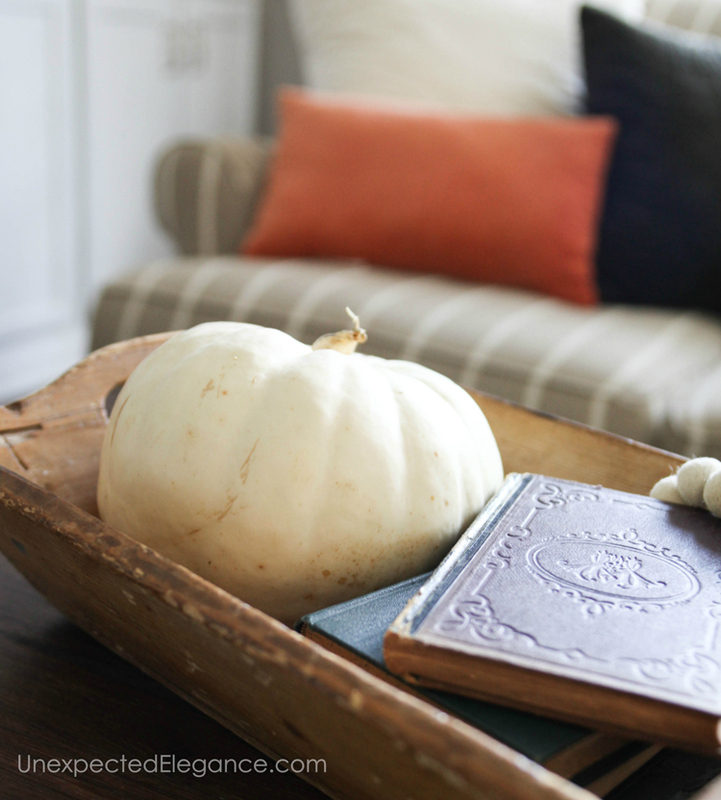 For more ideas, you can check out my fall home tour HERE.